Command-Trac locking hub is used on Model 30 front axles. This system can be shifted between 2WD and 4WD high range while vehicle is moving. The only time vehicle must be stopped to shift into or out of 4WD is when shifter is in low range. See Fig. 1. Selec-Trac locking hubs allow full or part time 4WD. Used on Model 30 front axles, system can be shifted into 2WD or 4WD modes only when vehicle is stopped. See Fig. 2. Position mode select switch to "4WD" position while driving vehicle 2-3 MPH. Axle should ratchet and clunk into position. Transfer case should shift after axle shifts, accompanied by hissing sound from mode selector switch. 1) Position mode select switch to "2WD" position. Transfer case should shift to 2WD and not allow shifting into 4WD or "LO" range. 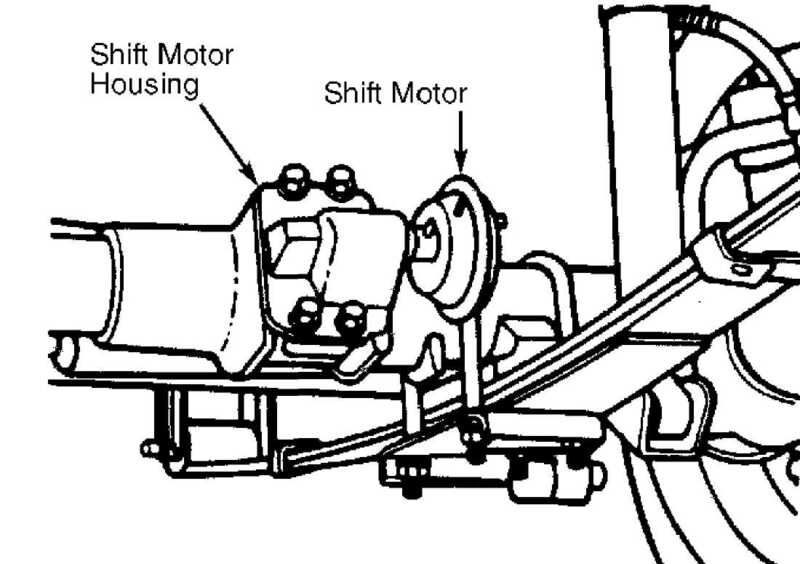 Axle should shift after transfer case shifts. 2) To determine if front axle has completed a shift out of 4WD into 2WD, position mode select switch back to "4WD" position while operating vehicle at slow speed. If vehicle shifts into 2WD, axle will ratchet. If shift is not completed, transfer case will shift into 4WD and hissing sound will come from mode select switch. 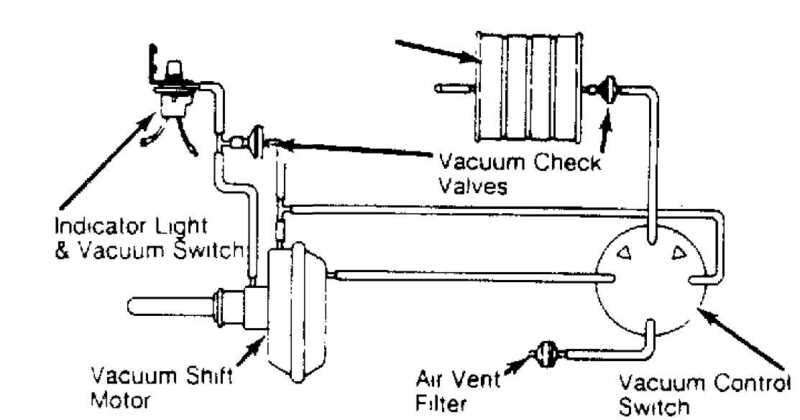 Disconnect vacuum harness from front axle shift motor. to shift motor. Rotate right front wheel to disengage axle. cap transfer case connecting port. Apply 15 in. Hg vacuum to motor. Model 207 transfer case. Selec-Trac uses Model 228 transfer case. nose pliers. Pull remaining components of automatic hub from wheel. (J-6893-D), tighten wheel bearing adjusting nut to 50 ft. lbs. (60 N.
outer clutch housing splines with splines of wheel hub. cap screws to 40-50 INCH lbs. (4.5-5.6 N.m). Raise and support vehicle. Drain shift housing fluid. housing. Mark shift fork and housing for reassembly. See Fig. 3.
rings. Remove shift motor from housing. Remove "O" ring from motor. Always use a new "O" ring for reassembly. housing and slide shift fork onto shaft. Position motor and housing on axle. Add axle lubricant to shift motor housing. Install shift fork in shift collar and install housing bolts. Connect all vacuum harnesses to motor.